Whether in laboratories, workshops or on site, these temperature dry-well calibrators can meet any calibration requirement. As an option, all instruments are available with an integrated measuring instrument. This enables the measurement of resistances, thermoelectric voltages and also current signals (from thermometers with a 0/4 ... 20 mA transmitter) and their direct display in °C. Using our calibration software and a laptop computer, fully automatic calibrations of electrical thermometers can be carried out anywhere. It is also possible to retrofit the integrable measuring instrument into existing calibrators. 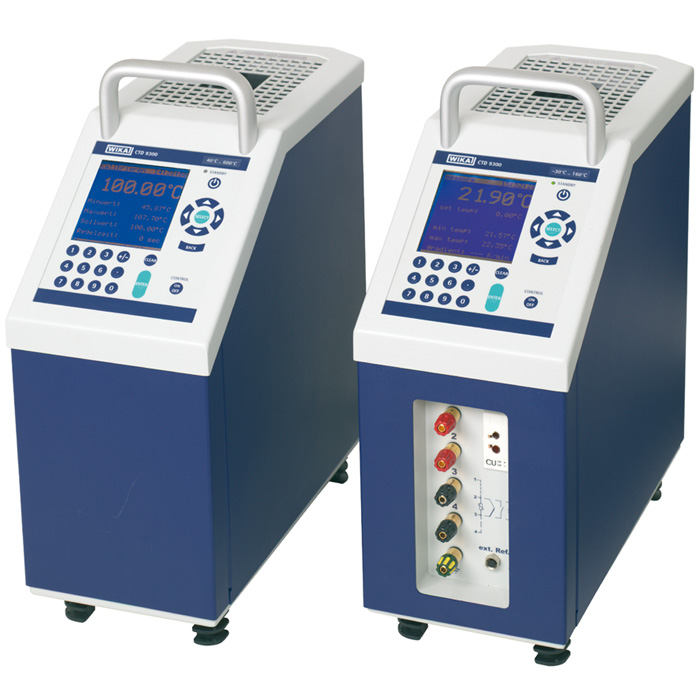 The temperature dry-well calibrators are available for two temperature ranges. The model CTD9300-165 is for temperatures ranging from -35 ... +165 °C (-31 ... +329 °F) and is primarily suitable for biotechnology, pharmaceutical and food industry applications. Above 40 °C (104 °F), there is the model CTD9300-650 for temperatures up to 650 °C (1,202 °F). This model is mainly used in power plants, plant construction and also the chemical industry. All instruments are fitted with blocks for large inserts, of 28 mm diameter by 150 mm long (1.1 x 5.91 in). Nowadays the main features required are not only high reliability and accuracy, but also safe and simple operation. Our temperature dry-well calibrators work with metal blocks that are cooled and heated electrically. Inserts with different inner diameters enable calibration of test items with a range of diameters. The calibration instruments of the CTD9300 series achieve the temperature set point extremely quickly, thanks to a controller developed by us specifically for calibration tasks, thus helping to save costs.